Callander Mountain Bike Trails is a planned MTB venture to be located in Coilhallan Woods, Callander within the Loch Lomond and The Trossachs National Park. In October 2014 iBikeRide reported on them winning the £100,000 investment from the Active Places Fund to build a 6km trail loop. The feasibility study was also completed in Feb 2015 and they now aim to have the full funding (est. @£210,000) by June 2015, have secured the land for development by December 2015, start construction from January through to April 2016 for a target launch in May 2016. A design has been developed incorporating a ‘blue’ graded trail, and several optional technical trail features, optional lines including a ‘red’ Grade option, and short cut routes, plus a 650m sensory trail with features and a MTB Skills Loop for specific coaching activities. Signage, interpretation and picnic benches will be provided. The trails will be designed to bridge a gap in the provision of mountain biking trails in the area offering easy to moderate. They will create a progression route to allow riders and coaches to support the development of technical cycling skills and be of great value to clubs, locals, and tourists to the eastern area of the Loch Lomond and The Trossachs National Park. Phase 1 is expected to cost approximately £200,000. An additional £10,000 is budgeted for signage, interpretation and picnic benches. Early in October 2014, 50% funding was secured from the Active Places 2014 Legacy Fund (£100,000) and discussions are underway with other potential sponsors. £5,000 has been secured from a local provider and an additional £25,000 is being negotiated with business contacts. FABB Scotland are sourcing specific funding for the sensory trail and CMBT are pursuing additional trust/grant applications for the balance. 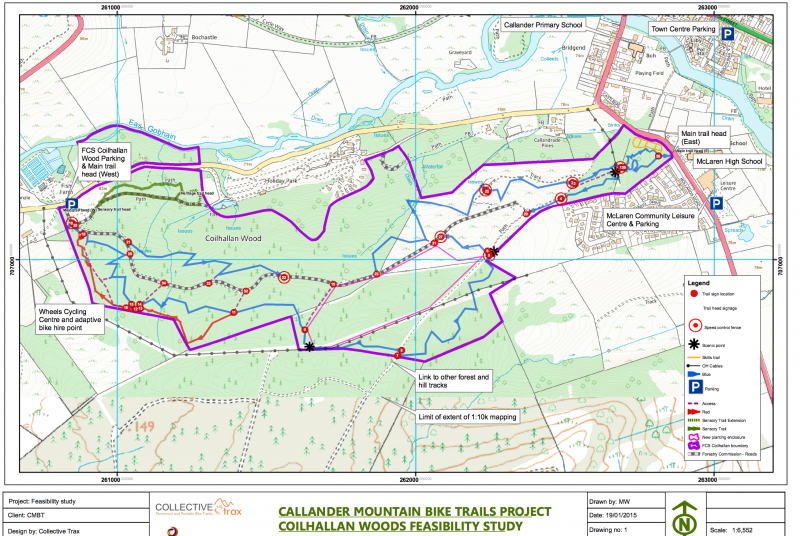 This project is seen as the ‘First Phase’ of a much larger project, which aims to establish Callander as a major MTB destination within Scotland. To achieve this CMBT anticipates undertaking further feasibility work and, subject to landowner agreements, developing MTB trails on other areas of land around the town, which ideally will be of a higher technical grade. The feasibility study was carried out by Collective Trax.